Currently most people only seriously re-consider their abilities behind the wheel at age 70 when they are required by law to reapply for their licence and certify they are safe to have one. Motorists need to be encouraged to face up to the limitations of physical and mental ageing at whatever stage of life it occurs. When ageing does become an issue, family members – young and old – must come together to talk about the impact it might have on mobility. In the United States a handbook called ‘We must talk’ is available to help overcome the often-taboo topic of getting old and its effect on daily life. These are amongst the conclusions of a report published today by the RAC Foundation. Can Older Drivers be Nudged? is authored by Dr Craig Berry of the International Longevity Centre – UK. In his report Dr Berry draws on the theory of behavioural economics to explain the challenges we face in taking decisions about driving in older age. Dr Berry says older drives already self-regulate their behaviour but they need to be given more help – particularly from those in the medical profession – to ensure that decisions made about driving are timely and appropriate not just for their benefit but also for that of other road users. “The older population is set to grow considerably. Official figures estimate that ten million people who are alive today will reach their 100th birthday. And by 2023 a quarter of the population is expected to be over 65. Key to our mental and physical wellbeing throughout life is personal mobility and for many that involves car use. “Older drivers are no less safe on the roads than the rest of the driving population, at least until the age of 80. 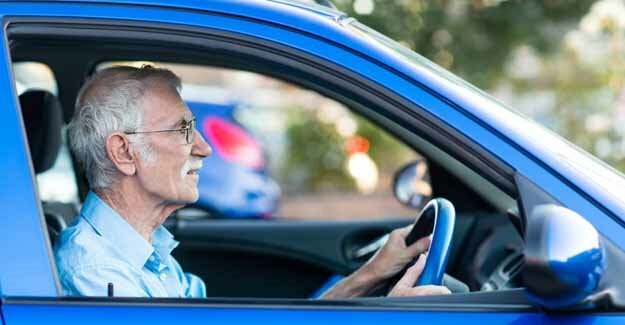 Currently drivers must self-certify at age 70 (and every three years after that), on the basis of a medical questionnaire, that they remain fit to drive. One option would be to require all drivers to self-certify each time they renew their photo-id, which is necessary every ten years. A number of driving licence options restricted by time of day or location could also be introduced, which older drivers could voluntarily sign up to in return for a discount on road tax or other driving costs. There are a number of potential ‘nudges’ that policy makers could use in this area, which are of benefit to both the individual and society – a bit of creative thinking is all that is required. Currently it is the duty of the licence holder to notify DVLA of any medical condition which may affect safe driving. On occasions there are circumstances when a driver will not or cannot do so. According to General Medical Council guidance for doctors, practitioners must make sure patients understand they have a condition which might impair their ability to drive. If a patient is incapable of understanding this advice, for example because of dementia, the doctor should inform the DVLA immediately. If a patient refuses to accept a diagnosis or the effect of the condition on their ability to drive then they are entitled to get a second opinion. If patients continue to drive when they are not fit to do so then a doctor must make every reasonable effort to persuade them to stop, which may include informing their next of kin. UK driving licences are normally valid until 70. There is no upper age limit, but after 70 renewal is necessary every three years. All licence applications require a medical self declaration.